PSNI deputy chief constable Stephen Martin. Following the reconstitution of the policing board, PSNI deputy chief constable Stephen Martin looks ahead to the formulation of a new Policing Plan and discusses its ability to build on recent outcomes-focussed initiatives. 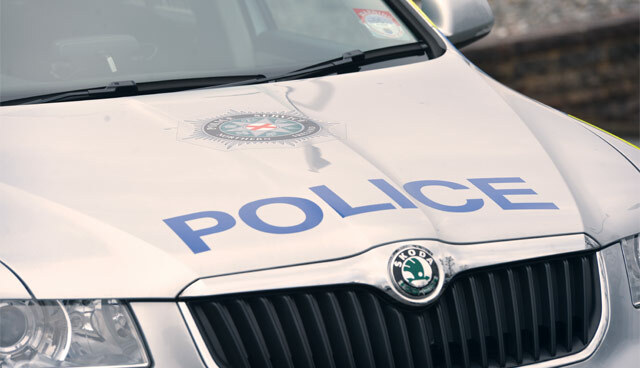 In 2016, the Northern Ireland Policing Board and the Police Service of Northern Ireland (PSNI) agreed a number of long-term strategic outcomes to be achieved by 2020. The long-term outcomes were to be reached through a range of measures set out annually within the Policing Plan. However, the collapse of Stormont and subsequent impairment of the Policing Board to carry out its full functions has resulted in the Police Service of Northern Ireland still operating within the plan designed for 2017-18. 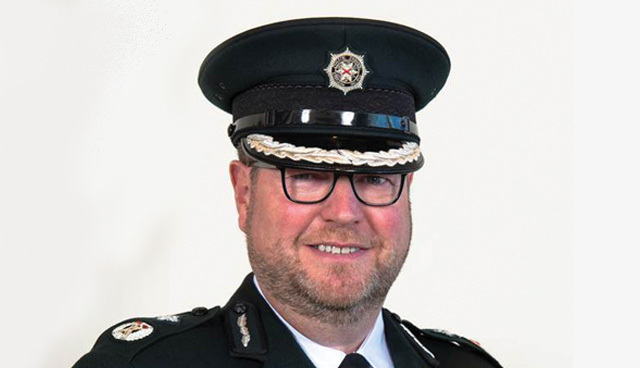 Recently, a move by the Secretary of State to bring forward the Northern Ireland (Executive Formation and Exercise of Functions) Act 2018 paved the way for the reconstitution of the Policing Board and it is expected that the Board and the PSNI, whilst not able to provide a timeframe, will make a fresh Policing Plan an item of priority business. Speaking to agendaNi, deputy chief constable Stephen Martin reflects an enthusiasm within the PSNI for the return of the Board. Martin highlights that as well as acting as a check and balance against policing’s significant power, the Board also serves as a great utility for the PSNI in its collaboration on policy, serving as an advocate for effective and good policing. As well as this, there are administrative benefits to a fully functioning Board, whose partial absence, Martin admits, had made some routine matters “difficult, slow and cumbersome”. Despite the various challenges emanating from Stormont’s collapse, many public services have sought to emulate the draft Programme for Government’s outcomes-based approach, something that was agreed prior to the fall of the institutions. A key element of the latest Policing Plan and also one of three essential building blocks outlined by the Patten Commission in its recommendations for police reform in 1999 is the area of policing with the community. An example provided by Martin is around a growth in identifying and tackling public protection crime. These include the likes of sexual offences, domestic violence and child abuse etc. Whilst statistics show an increase in crime in some of these areas, extensive partner relationships with outreach groups and improved confidence in the police to deal with such crimes can also be highlighted as a reason for increased reporting. He believes that the ability to utilise an outcomes-based approach has allowed for a more victim-centred approach, which has also helped improve relationships with the community and ultimately confidence in reporting. However, he is aware that there is still room for improvement. Returning again to the impact of having no legislative Assembly in Northern Ireland for over two years, he points to a failure to legislate for a new domestic abuse offence of coercive and controlling behaviour to strengthen protection for victims and bring the region in line with the rest of the UK, which was pioneered by the former Justice Minister Claire Sugden. An area in which the PSNI has been able to make significant progress in recent years is around digital transformation, both within and outside the organisation. Martin explains that a significant rise in cyber-dependent crime has forced the PSNI to upskill their approach to and understanding of this variety of crime. A measure of progress is the now fully-operational Cyber Crime Centre in Belfast, which Martin believes places the PSNI at the forefront of EU law enforcement in tackling cyber crime. “The centre is a sign of the chief constable’s commitment to being an adaptable and agile organisation”, says Martin, adding that investment has also been made in creating a number of locally based cyber support centres and training hundreds of officers as digital media investigators. Policing in a digital era has also led to recognisable changes in policing operations. Where previously demand for policing was dominant in public spaces, the emergence of technology has meant for a greater demand on private space policing. This shift has meant that the PSNI has had to ensure visibility and accountability to the public was not lowered as a result. In response, one method in which the PSNI has sought to successfully utilise technology is around digital communication. At the end of 2018, the organisation registered its one millionth follower across its social media platforms, a major milestone for the traditionally conservative organisation. 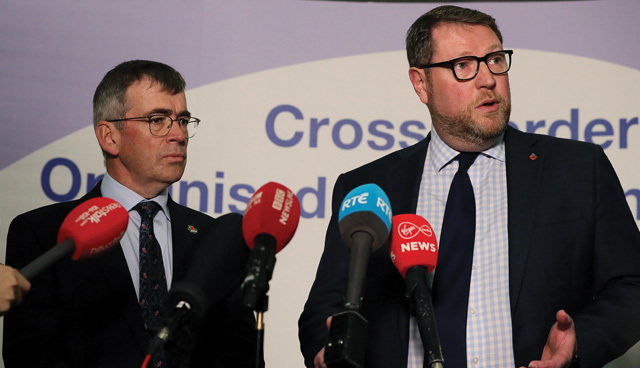 Garda Commissioner Drew Harris (left) and PSNI temporary deputy chief constable Stephen Martin speaking to the media during the cross-border conference on organised crime. However, Martin is quick to point out that recent developments are in the context that the PSNI “has always quietly led the way in terms of digital development”. Pointing to recent developments that equip officers to obtain and upload fingerprints at scene, engage with command and control systems, file missing person reports and access database information around individuals or vehicles, he states that the PSNI are continually seeking to be more innovative and to equip officers to be more effective and efficient. A prime example, he highlights, is that of body worn cameras, which not only allows for quicker collection of information by the PSNI but also more efficient sharing with partner agencies. Innovation and efficiency are not just being implemented on the frontline but throughout the organisation, explains the deputy chief constable. In particular, there has been a push in introducing innovation into the PSNI’s administration systems. Last year, the PSNI became the first police force in the UK to introduce a fully-online firearms administration process and this year the organisation are looking towards enhanced automation and robotics to free up staff from routine and repetitive tasks, allowing them to engage in more value-added activities. Innovation has also been key to the PSNI’s ambition to build on relationships and outcomes with its partners across the health, education and justice sectors. An example of an improved service offering through collaboration with a partner organisation is the introduction of a pilot scheme around full-time nurse-led custody health care. In 2018, custody nurse practitioners were introduced 24/7 at Musgrave Police Station in Belfast and early indications suggest that the success of the scheme could see it rolled out across other facilities in the near future. Giving context for the introduction of the scheme, which sees the PSNI working with the Belfast Health and Social Care Trust, the Public Health Agency and both the Department of Health and the Department of Finance, Martin outlines that of the roughly 25,000 people the PSNI arrest and detain each year, around 18 per cent are flagged for self-harming warnings, while over 70 per cent have risk factors for suicide. Nurse-led care embedded in the custody suite offers immediate response to those in need, in contrast to previously existing doctor-led care, which had notable delays. Improved health and wellbeing of staff has also been a major piece of work for the PSNI in recent years, with Martin stating his recognition that the distinctive competence of the organisation is in their staff. The PSNI have recently conducted two service-wide surveys, independently through Durham University, with a third one planned for 2019 around health, wellbeing, organisational fairness and engagement, amongst other things. The results recognise an improvement in responses between the first and second survey but Martin believes that there is still work to do in this area. 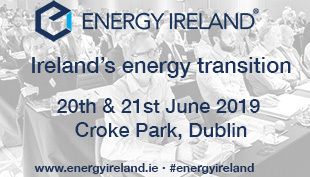 “On the basis of those surveys we have established an employee engagement and wellbeing group, led by senior officers, to show that we are responsive and listening to the workforce feedback. “In the last year we have invested significantly in our occupational health and welfare services, establishing one of the best occupational health and welfare departments in any police service right across these islands,” he adds. In fact, occupational health is one of four areas identified by chief constable George Hamilton for investment amidst shrinking budgets, including cyber crime; public protection and policing in the community. One area in which the PSNI have received criticism in recent years is around the diversity of its workforce and in particular the representation of the Catholic community. Martin himself recently talked publicly about the potential to re-introduce 50:50 recruitment after it as revealed that just 20 per cent of last year’s graduates were from a Catholic background. “Being representative of the community that you police is essential to retaining confidence and consent of that community,” he claims. “Clearly in Northern Ireland we had a particular difficulty in community background and this was recognised in the Patten Report with the recommendation of 50:50 recruitment. That measure saw the growth of Catholic representation in the service to 30 per cent when the then Secretary of State suspended those measures. “Today, we actually sit at 32 per cent but recent recruitment campaigns have been more disappointing than we would have hoped for in terms of the ability to join and stay with the process to become attested constables. We have worked hard to understand why this is occurring and commissioned an independent report by Deloitte to identify those barriers. A positive aspect of the research Martin identifies is the understanding that of those Catholic officers within the organisation that were surveyed, there was a feeling of a healthy internal environment. The latest recruitment campaign also had a positive recognition of an increase in applications from ethnic minority backgrounds, something welcomed by Martin, who states that as well as a recognisable increase in the organisation’s female composition post-Patten, the organisation has engaged in a whole range of positive action with organisations across all dimensions of diversity. This he states, can be recognised through the recently established Culture, Ethics and Diversity Board within the PSNI, chaired by the chief constable and which brings together representative groups throughout the PSNI to identify pathways of improvement. Recently the PSNI submitted a business case for £16.5 million in resources to recruit extra officers and staff and for new vehicles and other equipment in the context of Brexit, which was approved. Concluding on the PSNI’s ambitions going forward, Martin states that generating public confidence will continue to be a priority: “If the police service was a business its share price would be public confidence. Being engaging, creating lines of communication to explain how and why we work and being responsive is our organic challenge. It’s our challenge today and will be into the future.